For the taekwondo fighter, see Liu Xiaobo (taekwondo). Liu Xiaobo (Chinese: 刘晓波, 28 December 1955 – 13 July 2017) was a Chinese writer, literary critic, human rights activist, philosopher and Nobel Peace Prize laureate who called for political reforms and was involved in campaigns to end communist one-party rule in China. Some referred to him as "China's Nelson Mandela." He was incarcerated as a political prisoner in Jinzhou, Liaoning. On 26 June 2017, he was granted medical parole after being diagnosed with liver cancer and he died on 13 July 2017. Liu rose to fame in literary circles in 1980s with his literary critiques and he eventually became a visiting scholar at several overseas universities. He returned to China to support the 1989 Tiananmen Square protests and was imprisoned for the first time from 1989 to 1991, again from 1995 to 1996 and yet again from 1996 to 1999 for his involvement in the democracy and human rights movement. He served as the President of the Independent Chinese PEN Center, from 2003 to 2007. He was also the president of Minzhu Zhongguo (Democratic China) magazine since the mid-1990s. On 8 December 2008, Liu was detained due to his participation with the Charter 08 manifesto. He was formally arrested on 23 June 2009 on suspicion of "inciting subversion of state power". He was tried on the same charges on 23 December 2009, and sentenced to eleven years' imprisonment and two years' deprivation of political rights on 25 December 2009. During his fourth prison term, Liu was awarded the 2010 Nobel Peace Prize for "his long and non-violent struggle for fundamental human rights in China." Liu was the first Chinese citizen to be awarded a Nobel Prize of any kind while residing in China. He was the third person to have been awarded the Nobel Peace Prize while in prison or detention, after Germany's Carl von Ossietzky (1935) and Burma's Aung San Suu Kyi (1991). He was the second person to have been denied the right to have a representative collect the Nobel Prize for him as well as the second to die in custody, with the first being Ossietzky, who died in Westend hospital in Berlin-Charlottenburg after being detained in a Nazi concentration camp. Berit Reiss-Andersen, chairman of the Norwegian Nobel Committee, blamed the Chinese communist regime for his death and said that "Liu Xiaobo had contributed to the fraternity of peoples through his non-violent resistance against the oppressive actions of the Communist regime in China." He was also a strong critic of Chinese nationalism, believing that the "abnormal nationalism" which had existed in China over the last century had turned from a defensive style which contained "mixed feelings of inferiority, envy, complaint, and blame" into an aggressive form of "patriotism" that was filled with "blind self-confidence, empty boasts, and pent-up hatred". The "ultra-nationalism", being deployed by the Chinese Communist Party since the Tiananmen protests, has also become "a euphemism for worship of violence in service of autocratic goals." In January 1993, Liu was invited to visit Australia and the United States for the interviews in the documentary film The Gate of Heavenly Peace. Although many of his friends suggested that he take refuge abroad, Liu returned to China in May 1993 and continued his freelance writing. On 18 May 1995, the Chinese police took Liu into custody for launching a petition campaign on the eve of the sixth anniversary of the Tiananmen massacre, calling on the government to reassess the event and initiate political reform. He was held under residential surveillance in the suburbs of Beijing for nine months. He was released in February 1996 but was arrested again on 8 October for writing an October Tenth Declaration, co-authored by him and another prominent dissident, Wang Xizhe, mainly on the Taiwan issue, that advocated a peaceful reunification in order to oppose the Chinese Communist Party's forceful threats against the island. He was ordered to serve three years of re-education through labor "for disturbing public order" for that statement. Liu's writing is considered subversive by the Communist Party of China, and his name is censored. He called for multi-party elections and free markets, advocated the values of freedom, supported separation of powers and urged the governments to be accountable for its wrongdoings. When not in prison, he was the subject of government monitoring and he was also put under house arrest during times that the government considered politically sensitive. 1996 3 years of re-education through labor Disturbing the social order Jailed in a labor education camp for three years. In 1996, he married Liu Xia. Released in 1999. Liu Xiaobo actively participated in the writing of Charter 08 and signed it along with more than three hundred Chinese citizens. The Charter is a manifesto that was released on 10 December 2008 in order to coincide with the 60th anniversary of the adoption of the Universal Declaration of Human Rights. It was written in the style of the Czechoslovak Charter 77, and calls for more freedom of expression, human rights, more democratic elections, the privatization of state enterprises and land, and economic liberalism. As of September 2010, the Charter has collected over 10,000 signatures. Two days before the official release of Charter 08, late on the evening of 8 December 2008, Liu was taken into custody by the police, as was Zhang Zuhua, another scholar and Charter 08 signatory. According to Zhang, the two were detained on suspicion of collecting signatures for the Charter. While Liu was detained in solitary confinement, he was forbidden to meet with either his lawyer or his family, but he was allowed to eat lunch with his wife, Liu Xia, and two policemen on New Year's Day 2009. On 23 June 2009, the Beijing procuratorate approved Liu's arrest on charges of "suspicion of inciting subversion of state power," a crime under Article 105 of China's Criminal Law. In a Xinhua news release announcing Liu's arrest, the Beijing Public Security Bureau alleged that Liu had incited the subversion of state power and the overthrow of the socialist system through methods such as spreading rumors and slander, citing almost verbatim Article 105; the Beijing PSB also noted that Liu had "fully confessed". Liu wrote a statement, entitled "I have no enemies", intending for it to be read at his trial. He was never given the right to speak. The essay was later read in the 2010 Nobel Peace Prize ceremony, which Liu was unable to attend due to his imprisonment. On 25 December 2009, Liu was sentenced to eleven years' imprisonment and two years' deprivation of political rights by the Beijing No. 2 Intermediate Court on charges of "inciting subversion of state power". According to Liu's family and counsel, he planned to appeal the judgment. In the verdict, Charter 08 was named as part of the evidence supporting his conviction. John Pomfret of The Washington Post said Christmas Day was chosen to dump the news because the Chinese government believed Westerners were less likely to take notice on a holiday. In December 2009, the European Union and United States issued formal appeals calling for the unconditional release of Liu Xiaobo. China's government, responding to the international calls prior to the verdict, stated that other nations should "respect China's judicial sovereignty and not do things that will interfere in China's internal affairs". On 8 October 2010, the Nobel Committee awarded Liu the Nobel Peace Prize "for his long and non-violent struggle for fundamental human rights in China", saying that Liu had long been front-runner as the recipient of the prize. Liu's wife, Liu Xia, expressed gratitude on behalf of her husband to the Nobel Committee, Liu's proposers, and those who have been supporting him since 1989, including the Tiananmen Mothers—family members or representatives of those who were killed, or had disappeared, in the military crackdown of the protests of 4 June 1989. She said, "The prize should belong to all who signed Charter 08 and were jailed due to their support". China reacted negatively to the award, immediately censoring news about the announcement of the award in China, though later that day limited news of the award became available. [clarification needed] Foreign news broadcasters including CNN and the BBC were immediately blocked, while heavy censorship was applied to personal communications. The Chinese Foreign Ministry denounced the award to Liu Xiaobo, saying that it "runs completely counter to the principle of the award and it is also a desecration of the Peace Prize". The Norwegian ambassador to the People's Republic of China was summoned by the Foreign Ministry on 8 October 2010 and presented with an official complaint about the granting of the Nobel Peace Prize to Liu. The Chinese government has called Liu Xiaobo a criminal and stated that he does not deserve the prize. Chinese dissident Wei Jingsheng, in his response to news of the award, criticized Liu by calling him "the accomplice of the Communist regime." As a result, nearly all large-scale commercial trades are limited, and their relation soured until after Liu Xiaobo's death in 2017, when talks begin. In October 2018, the Norwegian King Harald V visited Beijing and met with Chinese president Xi Jinping, symbolizing the recovery of China-Norway relations. Liu Xiaobo died on 13 July 2017 in Shenyang's First Hospital of China Medical University from liver cancer. Since his death, the fate of Liu Xiaobo has been compared by the media of the world to that of Carl von Ossietzky, Nobel Laureate in 1935 who also died as a prisoner in Germany 1938. Whilst Liu's death was widely reported in the Western media, people in the West believed that it was mentioned only in a perfunctory manner in the press in China. It was said that censors deleted images or emojis of candles, or a simple "RIP"; searches on Sina Weibo regarding Liu's health returned the message: "According to relevant laws and policies, results for 'Liu Xiaobo' cannot be displayed". The Citizen Lab documented censorship of the death of Liu Xiaobo on WeChat and Weibo." They noted on 16 July censorship on WeChat of images related to Liu after his death, and found that even images were being blocked in one-to-one chat the first time as well as in group chat and WeChat Moments. Based on analyses of search term blocking on Weibo, the lab confirmed that a blanket ban on searches for Liu Xiaobo's name was still being applied. They said: "In fact, just his given name of Xiaobo is enough to trigger censorship in English and both Simplified and Traditional Chinese..."
Republic of China: President of the Republic of China Tsai Ing-wen pleaded with the Communist government to "show confidence in engaging in political reform so that the Chinese can enjoy the God-given rights of freedom and democracy ... The Chinese Dream is not supposed to be about military might. It should be about taking ideas like those from Liu Xiaobo into consideration. Only through democracy, in which every Chinese person has freedom and respect, can China truly become a proud and important county." In his tribute on Facebook, former ROC President and leader of the Kuomintang Ma Ying-jeou said out that the Chinese dream should develop proportionally on freedom and human rights. Mayor of Taipei Ko Wen-je expressed condolences. France: President Emmanuel Macron, who hosted a press conference for visiting US President Trump, later paid tribute to Dr Liu in a tweet, praising him as "a freedom fighter". French Foreign Minister Jean-Yves Le Drian expressed condolences as well. Germany: Chancellor Angela Merkel described Liu Xiaobo as a "courageous fighter for civil rights and freedom of expression". Foreign Minister Sigmar Gabriel said that "China now has the responsibility to quickly, transparently and plausibly answer the question of whether the cancer could not have been identified much earlier." Japan: Both the Minister of Foreign affairs Fumio Kishida and Chief Cabinet Secretary Yoshihide Suga expressed condolences. Norway: Prime Minister of Norway Erna Solberg said that "It is with deep grief that I received the news of Liu Xiaobo's passing. Liu Xiaobo was for decades a central voice for human rights and China's further development." Thorbjørn Jagland, a member and former chairman of the Norwegian Nobel Committee, and a former Prime Minister of Norway, compared Liu Xiaobo to Carl von Ossietzky, noting that he became the second Nobel Prize laureate who was prevented from receiving the prize because he died in prison. An official statement by the Norwegian Nobel Committee blamed the Chinese communist regime for Liu Xiaobo's death and condemned the erosion of human rights as a universal value; on behalf of the committee, chairwoman Reiss-Andersen said that "Liu Xiaobo had contributed to the fraternity of peoples through his non-violent resistance against the oppressive actions of the Communist regime in China" and that "the Chinese Government bears a heavy responsibility for his premature death". Reiss-Andersen said Liu Xiaobo will remain "a powerful symbol for all who fight for freedom, democracy and a better world". She also lamented the "sad and disturbing fact that the representatives of the free world, who themselves hold democracy and human rights in high regard, are less willing to stand up for those rights for the benefit of others." United Kingdom: Foreign Secretary Boris Johnson called Liu a "lifelong campaigner for democracy, human rights and peace", and said that his death was a huge loss. He further stated that "Liu Xiaobo should have been allowed to choose his own medical treatment overseas" and called for the Chinese authorities "to lift all restrictions" on Liu's widow. United States: Although Donald Trump did not offer or get asked over Dr. Liu's death at a press conference with French President Emmanuel Macron, his press secretary did issue a condolence statement. Secretary of State Rex Tillerson said that "Mr Liu dedicated his life to the betterment of his country and humankind, and to the pursuit of justice and liberty," and urged Beijing to free Liu's widow. U.S. Ambassador to the United Nations Nikki Haley and U.S. Ambassador to China Terry Branstad both expressed condolences. The Congressional-Executive Commission on China, whose commissioners come from both the House of Representatives and Senate, issued a bipartisan statement. The United States House Foreign Affairs Subcommittee on Africa, Global Health, Global Human Rights and International Organizations held a hearing on Liu and his death (entitled "The Tragic Case of Liu Xiaobo"). Nancy Pelosi, the House Minority Leader, was saddened by the news of Liu's passing. Back on 18 May, both Republican Senator Ted Cruz and Representative Mark Meadows had re-introduced bills to resume their push to rename the address of Embassy of China in Washington, D.C. as "1 Liu Xiaobo Plaza." Bob Fu, a Chinese American human rights activist and pastor, told The Texas Tribune that he is "definitely more optimistic" about Cruz's bill getting enacted with President Trump in office. Later Senator Marco Rubio write a letter to sent Liu Xia, Liu Xiaobo's widow. Senator John McCain said that "this is only the latest example of Communist China's assault on human rights, democracy, and freedom." European Union: President of the European Commission Jean-Claude Juncker and President of the European Council Donald Tusk said in a joint statement that they had learned of Liu's death "with deep sadness" and that "We appeal to the Chinese authorities to allow his wife, Ms Liu Xia and his family to bury Liu Xiaobo at a place and in a manner of their choosing, and to allow them to grieve in peace". United Nations: UN High Commissioner for Human Rights Zeid Ra'ad Al Hussein said, "The human rights movement in China and across the world has lost a principled champion who devoted his life to defending and promoting human rights, peacefully and consistently, and who was jailed for standing up for his beliefs. Liu Xiaobo was the true embodiment of the democratic, non-violent ideals he so ardently advocated." No Enemies, No Hatred. The Belknap Press of Harvard University Press. 2012. ^ Freeland, Chrystia (13 July 2017). "Statement by Minister of Foreign Affairs following death of Liu Xiaobo" (Press release). Global Affairs Canada. ^ "Liu Xiaobo, China's Nelson Mandela". english.donga.com. Retrieved 1 March 2018. ^ Congressional-Executive Commission on China, Political Prisoner Database:Liu Xiaobo Archived 16 October 2012 at the Wayback Machine. ^ Gracie, Carrie (13 July 2017). "Liu Xiaobo: The man China couldn't erase". BBC News. Retrieved 1 March 2018. ^ a b c d e Beijing No. 1 Intermediate Court, Criminal Verdict no. (2009) yi zhong xing chu zi 3901, unofficial English translation in Human Rights in China, "International Community Speaks Out on Liu Xiaobo Verdict Archived 4 December 2012 at Archive.today," 30 December 2009. ^ Lovell, Julia (9 October 2010). "Beijing values the Nobels. That's why this hurts". The Independent. UK. Retrieved 9 October 2010. ^ Christophe Neff (17 July 2017). "Liu Xiaobo – Carl von Ossietzky" (in French). Blogs le Monde on LeMonde.fr. ^ a b "Norwegian Nobel Committee mourns Liu Xiaobo, statement by Chair Berit Reiss-Andersen". The Nobel Peace Prize. ^ "Verdict Against Liu Xiaobo". International PEN. Archived from the original on 8 March 2012. Retrieved 11 January 2012. ^ a b "劉曉波好友 怒批劉曉光無恥" (in Chinese). Retrieved 17 July 2017. ^ "新时代仍需要抗联精神(December 2004 )——杨念杨靖宇将军诞辰100周年特别报道". 吉林省图书馆 (in Chinese). Archived from the original on 2 June 2017. Retrieved 17 July 2017. ^ "Liu Xiaobo, Chinese Dissident Who Won Nobel While Jailed, Dies at 61". The New York Times. 13 July 2017. ^ a b "Liu Xiaobo – the quiet, determined teller of China's inconvenient truths". South China Morning Post. 13 July 2017. ^ "5 things you need to know about Liu Xiaobo". pbs.org. 10 December 2010. ^ Huang, Cary; Mai, Jun (14 July 2017). "Liu Xiaobo – the quiet, determined teller of China's inconvenient truths". South China Morning Post. Retrieved 20 December 2017. ^ Xiaobing, Li (2016). Modern China. ABC-CLIO. p. 106. ISBN 978-1-61069-625-8. ^ 余世存 (2 June 2008). "北京当代汉语研究所2008年公告". Chinese Pen. Archived from the original on 18 July 2011. ^ Kristof, Nicholas. "Liu Xiaobo, We Miss You". The New York Times. Retrieved 13 July 2017. ^ Branigan, Tania. "Liu Xiaobo obituary". The Guardian. Retrieved 13 July 2017. ^ "Factbox: Who is Liu Xiaobo?". Reuters. 9 December 2010. ^ "Jailed Chinese Nobel Peace laureate Liu Xiaobo released after diagnosis of terminal cancer". The Daily Telegraph. 26 June 2017. ^ name=nybooks20120205>Leys, Simon (9 February 2012). "He Told the Truth About China’s Tyranny". The New York Review of Books. ^ Leys, Simon (9 February 2012). "He Told the Truth About China’s Tyranny". The New York Review of Books. ^ Letter from Liu Xiaobo to Liao Yiwu. Human Rights in China. ^ McKey, Robert (8 October 2010). Jailed Chinese Dissident's 'Final Statement', The New York Times. ^ a b Buckley, Chris. "Liu Xiaobo, Chinese Dissident Who Won Nobel While Jailed, Dies at 61". The New York Times. Retrieved 13 July 2017. ^ Johnson, Ian. "China's 'Fault Lines': Yu Jie on His New Biography of Liu Xiaobo". The New York Review of Books. Retrieved 13 July 2017. ^ Sautman, Barry; Yan, Hairong. "Do supporters of Nobel winner Liu Xiaobo really know what he stands for?". The Guardian. Retrieved 13 July 2017. ^ a b Xiaobo, Liu. "The Iraq War and the 2004 U.S. Election 伊战与美国大选". Independent Chinese Pen Center. Retrieved 13 July 2017. ^ Xiaobo, Liu. "The Prison Abuse Scandal and Iraq's Status". Independent Chinese Pen Center. Retrieved 13 July 2017. ^ Sautman, Barry; Yan, Hairong (15 December 2010). "Do supporters of Nobel winner Liu Xiaobo really know what he stands for?". The Guardian. Retrieved 3 November 2011. ^ Wang Ming, "A Citizen's Declaration on Freedom of Speech," China Rights Forum (spring 1997). ^ Branigan, Tania (27 February 2010). "My dear husband Liu Xiaobo, the writer China has put behind bars". The Guardian. ^ "Wife of Nobel Peace Prize winner talks about daily struggle". Deutsche Welle. 8 October 2010. ^ Watts, Jonathan (25 December 2009). "Chinese human rights activist Liu Xiaobo sentenced to 11 years in jail". The Guardian. ^ Baculinao, Eric and Gu, Bo (8 October 2010)In China, citizens find ways to learn of Nobel prize[permanent dead link], NBC News. ^ Link, Perry. "Charter 08 Translated from the Chinese by Perry Link The following text of Charter 08, signed by hundreds of Chinese intellectuals and translated and introduced by Perry Link, Professor of Chinese Literature at the University of California, Riverside". The New York Review of Books. Retrieved 10 December 2008. ^ Reporters Without Borders, "Fondation de France Prize: Liu Xiaobo Receives Prize for Defence of Press Freedom," 21 December 2004. ^ 和平獎得主劉曉波小傳, Ming Pao, 8 October 2010, Hong Kong. ^ Ramzy, Austin (8 October 2010). "Chinese Dissident Liu Xiaobo Wins Nobel Peace Prize". Time. Retrieved 9 October 2010. ^ Link, Perry. "Charter 08 Translated from Chinese by Perry Link The following text of Charter 08, signed by hundreds of Chinese intellectuals and translated and introduced by Perry Link, Professor of Chinese Literature at the University of California, Riverside". The New York Review of Books. Retrieved 10 December 2008. ^ a b "China Detains Dissidents ahead of Human Rights Day," Reuters, 9 December 2008; "Report: Chinese Police Detain Political Critic," Associated Press, 9 December 2008. ^ Macartney, Jane (8 December 2009). "Chinese dissident Liu Xiaobo begins second year of detention without charge". The Times. London. ^ a b "Writers Call for China Dissident's Release," Reuters, 9 December 2008. ^ Human Rights Watch, "China: Liu Xiaobo's Trial a Travesty of Justice," 21 December 2009. ^ Michael Anti, "Liu Xiaobo's brother-in-law says the trial ends without result. Waiting for lawyer coming out," 23 December 2009. ^ Chinese angered by 'interference' in dissident trial BBC. ^ Sean McCormack, Sean McCormack (11 December 2008). "Harassment of Chinese Signatories to Charter 08 Press Statement Sean McCormack (spokesman)". U.S. Department of State. Archived from the original on 14 December 2008. Retrieved 10 December 2008. ^ "Letter from the Consortium for the Release of Liu Xiaobo to China's President Hu Jintao," Human Rights Watch. 22 December 2008. ^ "One World Homo Homini award goes to Chinese dissident". Aktualne.cz. 12 March 2009. Retrieved 3 December 2009. ^ "Chinese dissident Liu Xiaobo jailed for subversion". BBC World News. 25 December 2009. Retrieved 25 December 2009. ^ "Foreign Ministry Spokesperson Jiang Yu's Regular Press Conference on 24 December 2009". Ministry of Foreign Affairs, the People's Republic of China. 25 December 2009. ^ "Imprisonment of Chinese dissident deeply concerns UN human rights chief". United Nations News Service. 25 December 2009. ^ "Canada 'deplores' sentencing of Chinese dissident". Agence France-Presse. 26 December 2009. ^ "Switzerland joins protests against China". Swissinfo. 26 December 2009. ^ "Ma asks Beijing to tolerate dissidents". Taiwan News. Central News Agency. 27 December 2009. ^ Anderlini, Jamil (15 January 2010). "The Chinese dissident's 'unknown visitors'". Financial Times. ^ "OPEN LETTER TO THE PRESIDENT OF THE PEOPLE'S REPUBLIC OF CHINA" (PDF). European Association for Chinese Studies. 22 January 2010. ^ "A Chinese Champion of Peace and Freedom". Project Syndicate. 18 January 2010. ^ a b "China opposes Nobel for jailed dissident, lawmakers back Liu Xiabo". phayul.com. 6 February 2010. ^ a b "Petition Urges Nobel for Jailed Chinese Writer" article by Andrew Jacobs in The New York Times 25 September 2010. Retrieved 25 September 2010. ^ "A Nobel Prize for a Chinese Dissident". The New York Times. 20 September 2010. ^ Luhn, Alec (28 July 2015). "National Endowment for Democracy is first 'undesirable' NGO banned in Russia". The Guardian. ISSN 0261-3077. Retrieved 14 July 2017. ^ "The ilb appealed for a worldwide reading on March 20th 2012 for Liu Xiaobo". Berlin International Literature Festival. ^ a b "Wife of jailed Chinese Nobel Laureate appeals for his retrial". Reuters. 19 November 2013. ^ "The Nobel Peace Prize 2010". Nobelprize.org. Retrieved 8 October 2010. ^ Schiller, Bill (8 October 2010). "China tries to block news of dissident's Nobel prize". Toronto Star. Retrieved 8 October 2010. ^ Criscione, Valeria (27 October 2010). "Was China behind cyber attack on Nobel Peace Prize website?". The Christian Science Monitor. Retrieved 10 November 2010. ^ "China censors Nobel award". Bangkok Post. 8 October 2010. ^ Eric Baculinao and Bo Gu, "In China, citizens find ways to learn of Nobel prize" Archived 2 December 2011 at WebCite, NBC News, 8 October 2010. ^ Victor Mair, "Liu Xiaobo", Language Log, 10 October 2010. ^ "China Angered By Selection of Dissident Liu Xiaobo for Nobel Peace Prize". ABC News. 8 October 2010. Retrieved 8 October 2010. ^ Vehaskari, Aira Katariina (8 October 2010). "Chinese dissident Liu Xiaobo wins Nobel Peace Prize". Agence France-Presse. Retrieved 8 October 2010. ^ "外交部发言人马朝旭答记者问". Ministry of Foreign Affairs of the People's Republic of China. 8 October 2010. Retrieved 8 October 2010. ^ "Awarding Liu Xiaobo Nobel peace prize may harm China-Norway relations, says FM spokesman". Xinhua News Agency. 8 October 2010. ^ Wei Jingsheng (15 October 2010). "What Today's Nobel Peace Prize Offers?". chinaaffairs.org. Retrieved 21 December 2010. ^ "China, Norway vow to write new chapter in bilateral ties - Xinhua | English.news.cn". www.xinhuanet.com. Retrieved 22 February 2019. ^ a b "Chinese paper rejects comparison between Mandela and Nobel laureate Liu". Reuters. 11 December 2013. ^ Bei Feng (11 October 2010). "Viewing the Liu Xiaobo response through Twitter", China Media Project of the University of Hong Kong. ^ "Chinese Nobel prize winner's wife detained". CNN. 11 October 2010. Retrieved 11 October 2010. ^ "Chinese Nobel Winner's Wife Detained". Slashdot. 10 October 2010. Retrieved 11 October 2010. ^ "Embassies represented at the Nobel Peace Prize Ceremony on December 10". The Norwegian Nobel Institute. 7 December 2010. Archived from the original on 12 December 2010. Retrieved 14 December 2010. ^ "Chinese Nobel boycott gains support". Al Jazeera. 7 December 2010. Archived from the original on 10 December 2010. Retrieved 11 December 2010. ^ Blanchard, Ben (8 December 2010). "China to award own peace prize ahead of Nobel award". Reuters. Retrieved 11 December 2010. ^ "China to award own peace prize ahead of Nobel award". Focus Taiwan. 8 December 2010. Retrieved 11 December 2010. ^ Buckley, Chris; Ramzy, Austin (26 June 2017). "Liu Xiaobo, Chinese Nobel Laureate, Leaves Prison for Cancer Care". The New York Times. Retrieved 12 July 2017. ^ Ramzy, Austin. "Chinese Hospital Invites Cancer Experts to Help Treat Nobel Laureate". The New York Times. Retrieved 5 July 2017. ^ "Liu Xiaobo Status Update". First Hospital of China Medical University. 6 July 2017. Retrieved 12 July 2017. ^ "Professor of Radiation Oncology". The University of Texas MD Anderson Cancer Center. Retrieved 12 July 2017. ^ "Professor of Surgery and Chairman, Department of Surgery". University of Heidelberg. Retrieved 12 July 2017. ^ "American & Germany Experts RSVP'd Invitation to Join National Experts Group to Consult on Liu Xiaobo's Illness". First Hospital of China Medical University. 8 July 2017. Retrieved 12 July 2017. ^ Hernandez, Javier C.; Buckley, Chris (9 July 2017). "Doctors Say Chinese Dissident Is Fit to Travel for Cancer Treatment". The New York Times. Retrieved 12 July 2017. ^ "American & German Experts Said that Liu Xiaobo Would Not Receive Better Treatment Abroad". First Hospital of China Medical University. 8 July 2017. Retrieved 12 July 2017. ^ Buckley, Chris (10 July 2017). "Chinese Doctors Say Nobel Laureate Is in Critical Condition". The New York Times. Retrieved 12 July 2017. ^ "Liu Xiaobo Illness Status Update". First Hospital of China Medical University. 10 July 2017. Retrieved 12 July 2017. ^ "Liu Xiaobo Illness Status Update". First Hospital of China Medical University. 12 July 2017. Retrieved 12 July 2017. ^ Ramzy, Austin (12 July 2017). "Liu Xiaobo, Nobel Laureate, Is Said to Be Suffering from Organ Failure". The New York Times. Retrieved 12 July 2017. ^ "Liu Xiaobo Died After Ineffective Rescue Measures". The First Hospital of China Medical University. Retrieved 13 July 2017. ^ Christophe Neff (17 July 2017). "Liu Xiaobo – Carl von Ossietzky". Le Monde (in French). ^ a b c d "World leaders call for release of Liu Xiaobo's widow". South China Morning Post. ^ a b c Hioe, Brian (17 July 2017). "Handling of Liu Xiaobo's Funeral Shows That Not Even The Dead Are Safe in China". ^ a b c "Ottawa's despicable display in China". Maclean's. Canada. 14 July 2017. ^ a b c "Liu Xiaobo cremated in 'private ceremony', amid fears for wife's safety". The Guardian. 15 July 2017. ^ "Chinese censors scrub Liu Xiaobo tributes online". South China Morning Post. ^ a b c d e "Liu Xiaobo's ashes scattered at sea after 'hasty' cremation". South China Morning Post. ^ a b Lahiri, Tripti. "Only one city in China is getting to mourn Liu Xiaobo". ^ "Liu Xiaobo: China's most prominent dissident dies". BBC. 13 July 2017. ^ Buckley, Chris (13 July 2017). "Liu Xiaobo, Chinese Dissident Who Won Nobel While Jailed, Dies at 61". The New York Times. ^ a b "Liu Xiaobo: China rejects foreign criticism over dissident's death". BBC. 14 July 2017. ^ Buckley, Chris (15 July 2017). "Liu Xiaobo, Chinese Dissident and Nobel Laureate, Is Cremated". The New York Times. ^ a b "China cremates body of jailed Nobel laureate Liu Xiaobo". ABC News. Archived from the original on 22 July 2017. ^ "Worldwide memorials held to remember Liu Xiaobo". South China Morning Post. ^ "劉曉波哥哥被批企圖分諾貝爾獎金 – 萬維讀者網". news.creaders.net. Retrieved 17 July 2017. ^ "Anger as ashes of Chinese dissident Liu Xiaobo are buried at sea in 'disgusting' funeral". ^ "Marchers pay respect to Liu Xiaobo". RTHK. 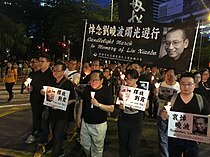 ^ "Thousands march in Hong Kong to remember Liu Xiaobo". Al Jazeera. ^ Haas, Benjamin (15 July 2017). "Hong Kong vigil for Liu Xiaobo sends powerful message to Beijing". The Guardian. ^ "Legco chief rebuffs attempts to discuss Liu Xiaobo – RTHK". ^ Lai, Catherine (13 July 2017). "President of Hong Kong legislature refuses to let lawmakers discuss Chinese dissident Liu Xiaobo". Hong Kong Free Press. ^ "China: Liu's Nobel Peace Prize was 'Blasphemy'". Voice of America. 14 July 2017. Retrieved 14 July 2017. ^ Ko, Yu-how; Shen, Pei-yao; Chung, Jake. "Taiwanese mourn Nobel laureate's passing". Taipei Times. Retrieved 14 July 2017. ^ "Speaker of Tibetan Parliament Offers Condolences on the demise of Nobel Laureate Liu Xiaobo". Central Tibetan Administration. 13 July 2017. ^ Choesang, Yeshe (14 July 2017). "Leaders of Tibet join global community to mourn Liu Xiaobo's death". Tibet Post. Retrieved 14 July 2017. ^ "Trump, Macron avoid criticism of China's Xi". Agence France-Presse. Retrieved 16 July 2017. ^ "中国异议人士刘晓波病逝 国际社会强烈反应". BBC. 13 July 2017. ^ "Merkel hails China's Liu as a courageous civil rights fighter". Reuters. 13 July 2017. ^ "Press Conference by Foreign Minister Fumio Kishida: The Passing of Mr. Liu Xiaobo". Ministry of Foreign Affairs of Japan. Retrieved 18 July 2017. ^ Suga, Yoshihide. "Press Conference by the Chief Cabinet Secretary". Prime Minister of Japan and His Cabinet. Retrieved 18 July 2017. ^ "Nobelprisvinner Liu Xiaobo er død" (in Norwegian). ^ "Foreign Secretary statement on Liu Xiaobo" (Press release). 13 July 2017. ^ "Statement from the Press Secretary on the Death of Liu Xiaobo" (Press release). White House Office of the Press Secretary. 13 July 2017. ^ 美国之音. "川普： 获悉刘晓波去世深感悲伤". Voice of America Chinese. ^ a b "World reacts with praise, sadness to Liu Xiaobo's death". 14 July 2017. ^ Tillerson, Rex W. (13 July 2017). "On the Passing of Liu Xiaobo". U.S. Department of State. Retrieved 14 July 2017. ^ Haley, Nikki (13 July 2017). "Ambassador Nikki Haley's Statement on the Passing of Liu Xiaobo". US Embassy & Consulates in China. Retrieved 16 July 2017. ^ Branstad, Terry (13 July 2017). "Statement from U.S. Ambassador Branstad on the passing of Liu Xiaobo". Retrieved 16 July 2017. ^ "CECC Commissioners Issue Statements on the Death of Nobel Laureate Liu Xiaobo". The Congressional-Executive Commission on China. 13 July 2017. Retrieved 16 July 2017. ^ The Tragic Case of Liu Xiaobo, Hearing of the United States House Foreign Affairs Subcommittee on Africa, Global Health, Global Human Rights and International Organizations (14 July 2017). ^ The Latest: US Congress holds hearing on Liu Xiaobo’s life, Associated Press (14 July 2017). ^ "Transcript of Pelosi Press Conference Today". Congresswoman Nancy Pelosi Serving California's 12th District. 13 July 2017. Retrieved 19 July 2017. ^ Cruz, Ted. "S.1187 – A bill to designate the area between the intersections of International Drive, Northwest and Van Ness Street, Northwest and International Drive, Northwest and International Place, Northwest in Washington, District of Columbia, as "Liu Xiaobo Plaza", and for other purposes". Congress.gov. Retrieved 16 July 2017. ^ Meadows, Mark. "H.R.2537 – To designate the area between the intersections of International Drive Northwest and Van Ness Street Northwest and International Drive Northwest and International Place Northwest in Washington, District of Columbia, as "Liu Xiaobo Plaza", and for other purposes". Congress.gov. Retrieved 16 July 2017. ^ Thomas, Neil (15 July 2017). "After dissident's death, Ted Cruz hopeful about changing Chinese Embassy address". Texas Tribune. Retrieved 16 July 2017. ^ "Trump praises Xi soon after death of Chinese dissident". CNBC. 13 July 2017. ^ "Statement by President George W. Bush on the death of Liu Xiaobo". North Texas e-News. Retrieved 14 July 2017. ^ "Joint statement by the President of the European Commission, Jean-Claude Juncker, and the President of the European Council, Donald Tusk on the passing away of Liu Xiaobo" (Press release). Europa (web portal). ^ One World Homo Homini award goes to Chinese dissident，12 March 2009 . ^ "Liu Xiaobo". Deutsche Welle. 29 April 2009. Retrieved 29 April 2009. ^ Liu Xiaobo DW, 7 October 2010. ^ "LIU XIAOBO'S NOBEL PEACE PRIZE WIN PUTS SPOTLIGHT ON CHINA RIGHTS VIOLATIONS". Wikimedia Commons has media related to Liu Xiaobo.